My update from last night seems to be a big hit on Facebook, so I thought I'd share it here, too. Hope you guys are having a great weekend! I had a lot of stops and starts with the detail work - flat gave up for a few days, in fact - but now it just needs a clear coat & some rubber stops on the bottom rails for safety. PHEW. I'm hoping to get a few action photos next week... so naturally I had to order a Darth Vader mask & cape for our 5 year-old model. Stay tuned! Update: Lots of folks are already asking for blueprints/templates, so I may try to get the pattern scanned in and arranged in a nice .pdf or such for those that want it. This will be a bit of a bear with such large pieces, though, so no promises on when that'll be available! This REALLY makes me wish I had any skill whatsoever with woodworking! My almost-three-year-old would love this! Jeez, Jen, if you'd have let me model it, I would have provided my own mask and cape... Great job! 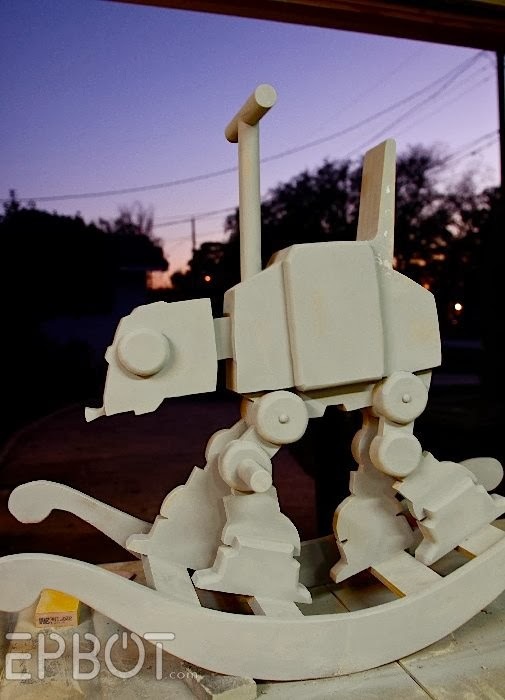 This AT-AT rocker just looks fabulous! So very impressive! Sell the pattern, don't give it away for free! And well done, as always. That's is so cool! Lucky 5 year old. I want an adult sized one! Find a print shop that can print and scan blue prints. (Or large format.) They should be able to scan large size and save to a pdf for you. That way you won't have to piece them together. The one I work at can scan prints up to 36" x 48". Where do YOU buy costumes? I ask because my sweet boy has outgrown/worn-out his Darth Vader costume. But also just curious where you're browsing for your costume items. I would buy the pattern! I was going to send you the link to a homemade mounted Wampa head, but then I remembered you are a fan of The Bloggess, too. She has the link in her Sunday wrap up. The Wampa head would be lovely with the AT-AT rocker. It was so good to meet up with you two this weekend. I'm sure you're both very busy, so we appreciate you taking the time to come socialize! Bee-YOO-tee-ful! Oh, my gosh, what a lucky kid! What's it feel like to know that you've just created a one-of-a-kind family heirloom for the recipient? That AT-AT is going to see many, many generations of happy kids. You guys are awesome! This is great. My husband would be jealous. Jen, do yourself a favor and check out Emily Sculpts on Facebook. She's a friend of a friend. He sent me her link because he knows I'm a closet Geekster :) Pretty sure you'll go nuts when you see her stuff! Girl, I just found out about Harold Ramis, and I can't stop crying. Somehow, you were the first person I thought of, and I don't book the faces, so I came here to bum out your nifty craft post. First I lose my elderly Pug, now this. Can we please pretend this week/month never happened? Jen was the first person I thought of when I saw the Harold Ramis news, too. Sorry to hear about your sweet puggie! Thanks, girl, really. Although I'll miss them both, I take comfort in knowing they are no longer in pain, and from kind thoughts like yours.